Who is the shipping carrier? All orders are shipped via UPS. What are your shipping options? We offer a full range of shipping options including Standard Ground Delivery, Three-Day, 2nd Day Air, and Overnight Delivery. Our standard shipping method is Ground unless otherwise selected or requested. Can I have my package delivered on Saturday? Yes, for Saturday delivery please contact Customer Service at 413-243-3370. Please note that UPS does not offer Saturday delivery in some areas of the country. Does UPS require a signature for delivery? No, a signature is not required but may be requested. Please contact Customer Service at 413-243-3370 to request a signature. Note that there is an additional UPS charge when a signature is requested. Do you ship to PO Boxes? Yes we can! We can also ship via USPS Priority Mail. Please contact Customer Service at 413-243-3370. Do you ship to APOs or FPOs? For questions and help with APO and FPO shipments please contact Customer Service at 413-243-3370. Do you ship internationally or to Hawaii or Alaska? No, we do not ship international deliveries. Yes we make deliveries to Hawaii or Alaska at regular UPS prices (Flat Rate does not apply),if you have additional questions please contact Customer Service at 413-243-3370. When will my order ship? Orders received by 12:00 p.m. Eastern Standard Time will normally be shipped the same business day. All other orders will be shipped the next business day after the order is received. We do not process or ship orders on Saturday or Sunday. Where are the orders shipped from? All of our products ship from our bakery in Lee, MA. When will I or my recipient receive the order? Depending on where the items are being shipped, the arrival date will vary. Please refer to the UPS zone map for specific delivery information. The UPS zone map may be found on the Shipping page. Will I receive an email notification when my order ships? Can I track my package? Yes, if you have provided a valid email address you will receive an email notification from UPS with your order tracking number. I just placed an order online. How do I know my order was received? After your order has been placed you will receive an email from Klara’s Gourmet Cookies confirming your order. Can I place my order now to ship later? Absolutely, just be sure to indicate the day you wish your order to arrive. Will you include a gift card? Yes, we will include a gift card with your personalized message when requested. You will have the opportunity to write your gift card during the Check Out process. Can the products be frozen to keep longer? Yes, we recommend that you enjoy your goodies as soon as they arrive, but they can be frozen. When you are ready to serve, thaw at room temperature for approximately one hour. Do your products contain nuts? Yes, some of the products do; when they do it is indicated in the product description. People with severe nut allergies should note that nuts are present in our bakery where the products are made. Are any of your products sugar-free or vegan? No, at this time we do not make sugar-free or vegan baked goods. Are any of your products gluten-free? Yes. Our Coconut Macaroons and our Chocolate Coconut Macaroons are both Gluten Free. We operate from a shared facility that produces both wheat based and non wheat based cookies. We segregate all of the ingredients for our gluten free products and produce them on certain days of the week after a thorough bakery cleaning has taken place. Additionally to ascertain that we have a gluten free product, we randomly test our products in house to a 5 ppm standard to make sure that our macaroons are gluten free. Are your products certified Kosher? No, they are not. What if I am not satisfied with my product? If your order has arrived damaged, or if you are dissatisfied for any reason, please contact Customer Service at 413-243-3370. We believe in 100% customer satisfaction and will work with you to ensure that you are happy with your Klara’s Gourmet Cookies purchase. How do I find out about special promotions and coupons? 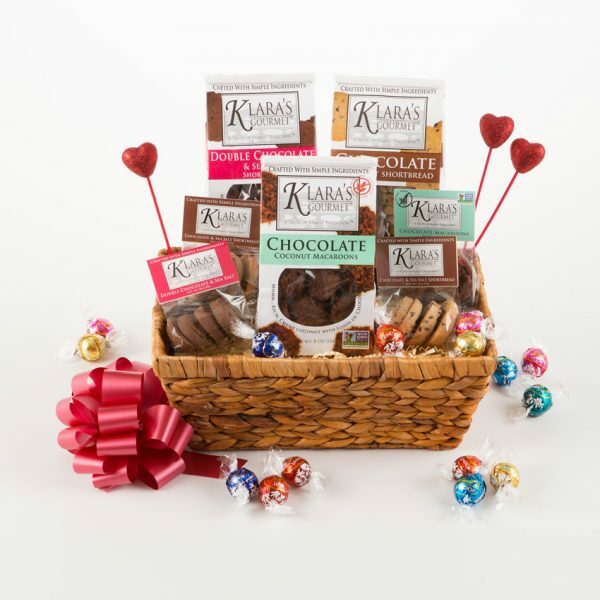 To receive electronic coupons and to be notified of special offers, simply join our mailing list on our Contact Klara page when you log onto the web store at www.KlarasGourmet.com.